Finally, after applying for certification in October 2016, after testing for fire retardance, and slip testing -R10. we now have our REMP Rubber flooring called SUBER Greentagged ! We are pleased that the REMP Suber rubber/cork product is now available in Australia in 26 colours! 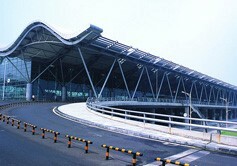 Zhengzhou Xinzheng International Airport is the principal airport serving Zhengzhou, the capital of Henan Province, China. There are domestic and regional flights from the airport to most major cities in the People's Republic of China, international cargo and passengers flights. The increasing demand for high protection from static inception was highlighted by the request for having Staticworx Eclipse Presto rubber at the new Olympus camera/equipment facility at FernTree Gully last year. It was arrived on time with only a 5 week turn around from ordering and the flooring was installed perfectly by Aywon Flooring and their crew. Many burgeoninig electronic companies and their shift towards miniaturizing circuitry even more for faster processing has meant the spiralling demand for a forring that is anti-static,dissipative and conductive at the same time. 360m2 of Endura rubber tiles in round profile and the colour black were installed recently at the National Musuem of Australia in Canberra. The architects chose Endura tiles because of their ease of cleaning and no need for waxing. Dalsouple was installed in a 100 year old house in North Fitzroy during recent renovations of the house. The owners wanted to be as sustainable as possible and chose Dalsouple natural rubber tiles due to their renewable aspects and low VOC's. Product: DalTerrazzo, Noir (black) background, Vert Pomme (apple green) and white terrazzo pattern.